Remember Hatchimals? The hatch-able toy that caused parents to wait in line for hours during last year's holiday shopping season. They're back this year -- with a twist. And joining those furry friends is a new collection of toys expected to land on every kid's wish list. According to toys review website TTPM, toymakers have once again turned to technology to deliver new play experiences. Another popular trend: retro-inspired toys like a modern-day Teddy Ruxpin. Could mini adorable robotic monkeys that cling to your finger make last year's hottest toy Hatchimals a distant memory? Maybe. 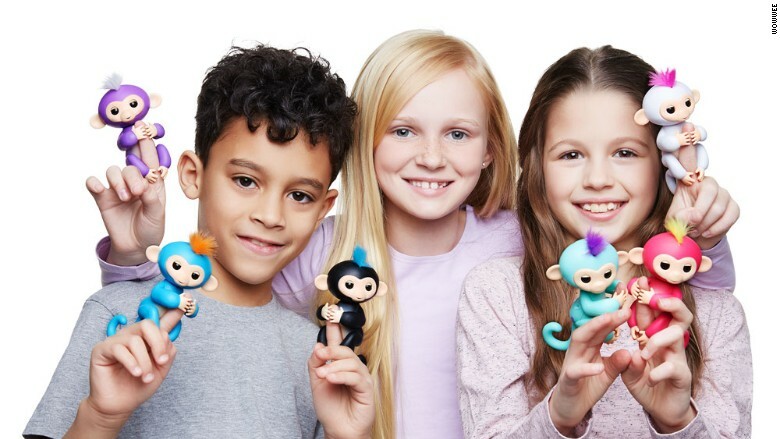 Fingerlings from WowWee are interactive baby monkeys that cling to fingers and hang by their tails. They react to sound, motion and touch through two sensors on the top of their heads. Stroke their head and they'll make a cooing sound; blow kisses and they'll make smooching sounds back at you. You can also gently rock them to sleep. These mini monkeys shake their heads and sing, too. Fingerlings come in six colors -- each with its own name, such as Bella, Fin and Boris. Price: $14.99 each.